Gerbillio is a browser add-on displaying coupons and various advertisements. So-called Gerbillio Deals are displayed on Internet Explorer, Google Chrome, and Mozilla Firefox. If you are wondering why you are provided with Gerbillio Deals, it is very likely that you have not noticed the installation of Gerbillio. This browser add-on is available at gerbillio.biz but can also be bundled with other programs. The application can be distributed by media players, browser extensions, etc. Hence, you should pay close attention to the installation process in order not to install unreliable programs. Gerbillio Deals are likely to appear on commercial websites, including ebay.com, amazon.com, bestbuy.com, and other websites. Gerbillio does not sell products and services and every coupon that you are provided with by the Gerbillio browser add-on is the property of third parties. Gerbillio does not accept responsibility for third parties’ offers, the content of the offers, pricing errors, and the quality of the products and services advertised. The same goes for other types of pop-ups displaying by Gerbillio, including web banners, in-line advertisements, and pop-up advertisements. Gerbillio is not liable for the content of the pop-ups provided by third parties and does not endorse them by displaying those ads. Besides online deals you may find advertisements promoting sweepstakes, surveys and updates for your programs. We recommend that you ignore such pop-ups because they may be deceptive. Gerbillio is developed by SuperWeb, which has released many identical programs, including Blarble, Web Flipper, Browser Mark, TasticSurf, and many others. All these application are known to display some deceptive advertisements which are aimed at obtaining users’ personal information or making them install various browser add-ons and trial versions of system optimization tools. If you want to prevent damage to your computer, not only should you ignore Gerbillio Deals; you should also disregard pop-ups inviting you to update your programs or to enter some online contests. However, it is not enough to ignore Gerbillio pop-ups. It is advisable to remove Gerbillio from the PC; and the sooner you do it, the better. Below you will find our step-by-step instructions on how to uninstall the program but our tem recommends using SpyHunter. This real-time computer security tool can easily remove unreliable browser cookies, adware, Trojan horses, and many other threats. Take action right to remove Gerbillio and to protect the operating system against malware and spyware threats. 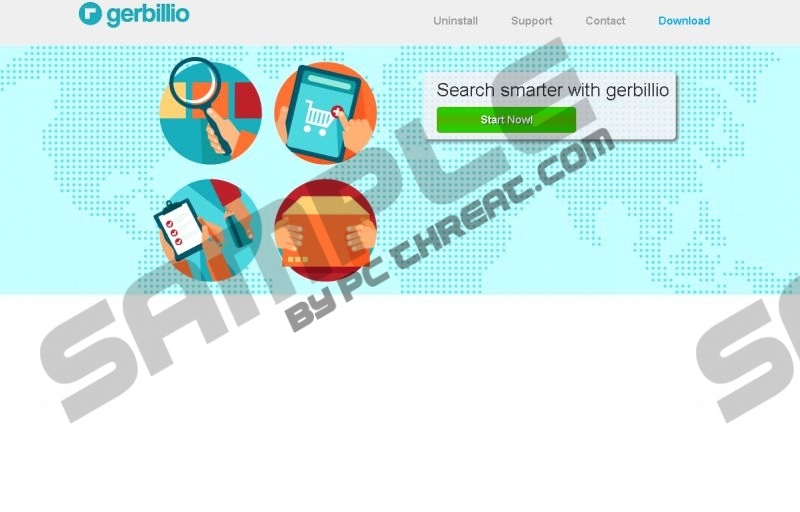 After uninstalling Gerbillio, install the scanner available below to find out whether all the components of Gerbillio are removed. If not, invest in the program to have harmful files removed. Quick & tested solution for Gerbillio Deals removal.